이 파일은 베트남어 위키백과 (Hình ảnh chọn lọc)에서 알찬 그림이었으며 최우수 이미지 중 하나로 여겨집니다. 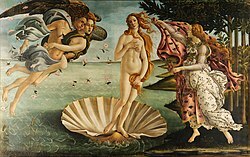 출처/촬영자 Adjusted levels from File:Sandro Botticelli - La nascita di Venere - Google Art Project.jpg, originally from Google Art Project. Compression Photoshop level 9.